Program Contents: 236 page 8½ x 11 soft-covered book. Includes CD-ROM with reproducible forms. This user-friendly resource provides over 50 reproducible forms and numerous intervention procedures founded in evidence-based research and standards. These forms and procedures have been developed and successfully applied in clinical work with children and adolescents having a wide range of diagnoses, including AD/HD, autism spectrum disorders, mood disorders, oppositional defiant disorders, and anxiety disorders. Each Part begins with a description of the purpose and use of the forms; a brief explanation of the contents of each form; and comments based on the authors’ anecdotal experiences, offering suggestions for how to use the forms in different situations. In many cases, a completed sample of the form or questionnaire is included. These completed sample forms are based on the case examples that appear in the book. Identification is always the first step in developing effective interventions. Therefore, Part 1 of the book is designed to facilitate gathering information to identify specific behaviors for change, their importance, and to generate hypotheses regarding the function(s) of the problem behavior. After a problem has been identified, measurement is the next task. A reliable baseline (i.e., pre-intervention) level is established so the clinician may better evaluate the effectiveness of the implemented interventions. 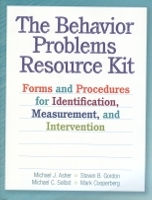 The forms in Part 2 facilitate recording and organizing data regarding the problem behavior. These forms can be used pre-intervention, during the intervention, and post-intervention to measure the extent and nature of changes. Problem behaviors can be measured by collecting data on frequency, duration and intensity. Measurement contributes to an understanding of the settings, antecedent predictors, problem behaviors and maintaining consequences. Extensive data collection using an Antecedent, Behavior, and Consequence (ABC) model permits the user to adapt the material to their personal, school or organizational needs. Interventions facilitate application of specific strategies. The material here is grouped by antecedent, behavioral, and consequence interventions. Antecedent interventions allow those working with the child to make the necessary changes prior to the occurrence of the challenging behavior. It is essential to do as much as possible to abolish the need for socially maladaptive behaviors. Behavioral interventions permit the replacement of the target or problem behavior. Skills training forms to address social, emotional, developmental, functional, and educational issues are available to teach coping strategies and facilitate change. Consequence interventions are designed to strengthen replacement behaviors and/or weaken inappropriate behaviors. Among the many forms are: a Task Analysis Questionnaire for School and Home, an Educational Accommodation Plan, a Behavioral Intervention Plan, a Social Skills Intervention Plan, a Functional Behavior Assessment Scale, a Social Skills Contract, and a Daily Behavior Report Card.